Recently, I've found it very hard to make decisions. Incapacitated hard. Every decision feels like it's going to be the end of the world. The absolute zombie apocalypse kind of end. Right now, I'm in India, entirely overwhelmed by what to do here. It was the same way with all of the places I've been in the last two months; Jordan, Turkey, South Africa, Puerto Rico, and even Asheville. 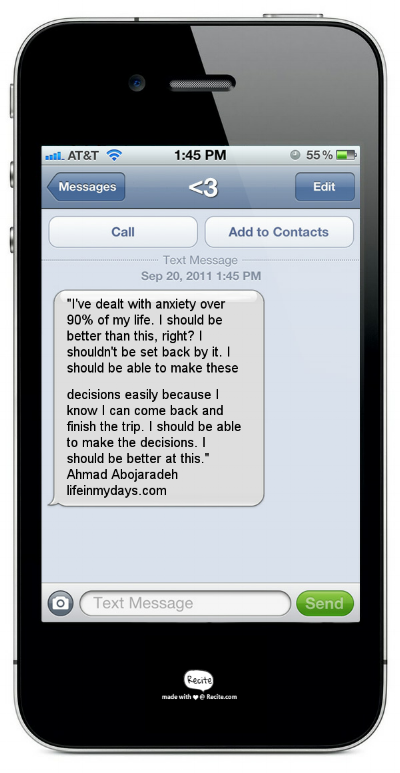 Each trip, or day when I'm anywhere, really, is plagued by decision-making anxiety. And, no matter how much I try, I can't decide. This isn't new, but the intensity of this is. I remember, when I went to Switzerland, I would literally hop on any train and make my way through the world. Every adventure counted for something. Now, even though the world has opened itself to me, I can't decide. Tonight, as I overthought another conversation, I figured out why; it's because of shame. Shame is the feeling we're hit with when we believe that we're not good enough for something. At first glance, Shame doesn't seem to fit here. But, digging deeper and understanding my reaction to my anxiety, all I find is Shame. I've dealt with anxiety over 90% of my life. I should be better than this, right? I shouldn't be set back by it. I should be able to make these decisions easily because I know I can come back and finish the trip. I should be able to make the decisions. I should be better at this. But no more. I won't always know what to do, or where to go. I will get stuck sometimes, making these decisions. And you know what? Maybe one day I'll cause the zombie apocalypse, but so what? We all know I will be on the front lines raising awareness about this zombie apocalypse that was at work, all along, systemically. All of those things are okay. I am okay. Period. I deserve to treat myself better, and I can. Shame may have gotten the better of me, yet again, but that doesn't make me a shame filled individual. It just means I did the wrong thing. There is hope for me yet. I also need to give a shout out to my social anxiety for having me go over future conversations and helping me find this stuff. Shame affects us all, with or without general anxiety, so I'm glad my social anxiety's got my back. Because of my social anxiety, I was able to identify what was really happening. My social anxiety allows me to see the future, at least that's how I like to think of it. I go through a thousand different variations of the same conversations, or events, before they occur. More often than not, one of the situations I've imagined actually comes true. Being able to have these conversations before they occur allows me to learn more about myself and the others I'm interacting with. So, how do we overcome shame? At times, shame can be a lifelong battle. However, to start, we simply need to identify it for what it is. We're human, we all mess up sometimes, that's not indicative of who we are as individuals. There's hope for all of us. It's okay to not be perfect, that in itself is perfection.